Udaipur City in Rajasthan state, India is well connected to other cities and states of the country through rail, road, and air. It has direct trains on the broad gauge network to almost all of the most of the major cities across Rajasthan and the rest of the country. Some of these cities include Jaipur, Alwar, Kota, Ajmer, Chittorgarh, Delhi, Kolkata, Mumbai, Indore, Ujjain, Surat, Mumbai, Baroda, and Gwalior. A metre gauge network is connected from the railway station of Udaipur City to Ahmedabad. The station has stops for luxurious trains of Rajasthan such as Royal Rajasthan on Wheels, The Palace on Wheels, Maharaja Express, and The Indian Maharaja. The major trains connecting Udaipur with Delhi through Udaipur City Railway Station include Chetak Express and Mewar Express. Udaipur also popularly referred to as the City of Lakes, is a big city of Rajasthan state, and a Municipal Corporation and the administrative headquarters of the Udaipur district. Udaipur city is located about 403 kilometres from the capital of the state, Jaipur. The city is a hot favourite among tourists from all over the world owing to the breathtaking sites it has to offer. Some of the best attractions here include City Palace, Suraj Gokhda, Mor-chowk (Peacock courtyard), Dilkhush mahal, Moti mahal, Sheesh mahal, Krishna vilas, Shiv Niwas Palace, Fateh Prakash Palace, Lake Palace, Jag Mandir, Monsoon Palace, Jagdish Temple, Sagasji Mandir, Fateh Sagar Lake, Lake Pichola, Saheliyon-ki-Bari, Gulab Bagh and Zoo, Doodh Talai, Bharatiya Lok Kala Mandal, Maharana Pratap Memorial or Moti Magri, Bohara Ganesh Ji, Nehru Garden, Bagore-ki-Haveli, Ahar Museum, Shilpgram, Neemach, Udaipur Solar Observatory, Sukhadia Circle, and Rajiv Gandhi Park. Hiring a taxi in Udaipur City will help you enjoy the tour in Rajasthan and areas around better. 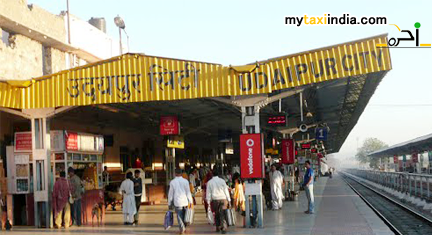 At My taxi India, we offer Udaipur City travellers airport transfers to and from Udaipur City Railway Sttion. Our service will keep you free from all kinds of hassles related to travel to the city of Udaipur. You can book our services at our online portal or one of our branch offices in Rajasthan. Our team of dedicated chauffeurs have been trained to ensure you a comfortable ride all the while. Our fleet of car is always ready at your service. The cars are well maintained and thoroughly checked for safe and smooth operations by our engineers prior to sending it across to you. You can select one to suit your specific budget and requirements. Right from standard budget cars to luxury cabs, we offer a huge range of options for you to choose from.